I’ll admit it. When it comes to teaching fractions, I cringe a little. There is no doubt that this is a very difficult concept for many young learners. The idea of breaking something into equal parts and creating a new number is something very hard to grasp. In order to meet all learning styles, you have to pull from all directions in order to introduce this new concept. 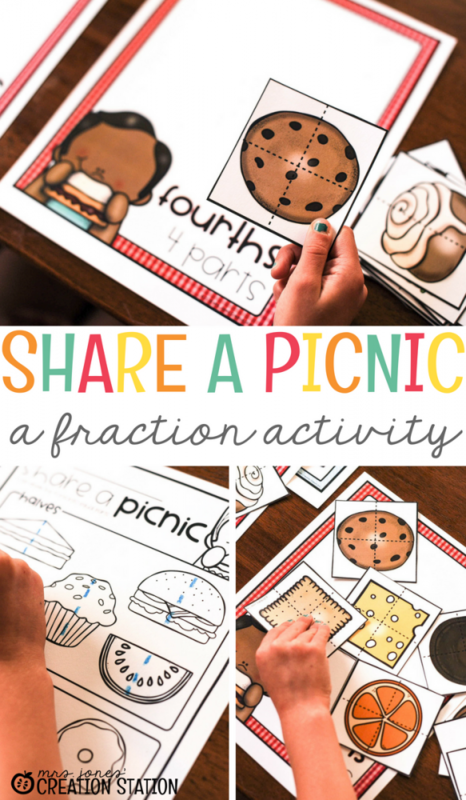 Here are a few of my favorite ways to teach fractions to hopefully take away the frustration! If you know me, I can find a book to tie in with any unit! And these are some of my favorite books that I use. 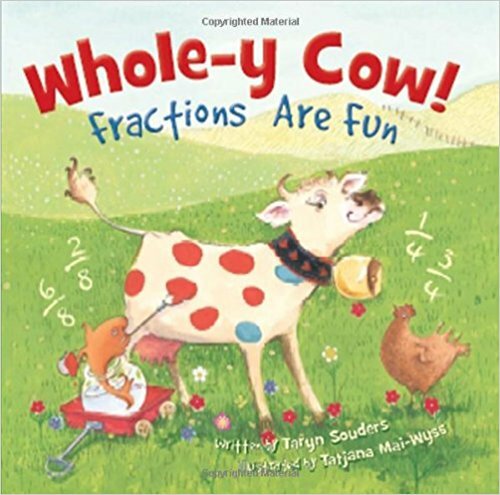 Whole-y Cow is an entertaining book for all kids. 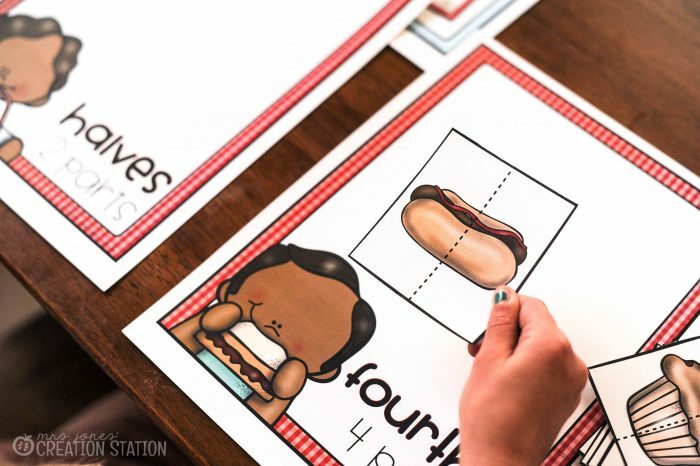 Not only will it make your students laugh, but it will encourage independent thinking. With fun poems and clues, students get an immediate sense of how to apply and understand the concept of fractions. You may want to wait and read this yummy book after lunch! You’ll have a classroom full of hungry learners if you don’t! Miss Bloom runs the Strawberry Inn. She finds her guests (and her hostess) all eating a fun midnight snack! 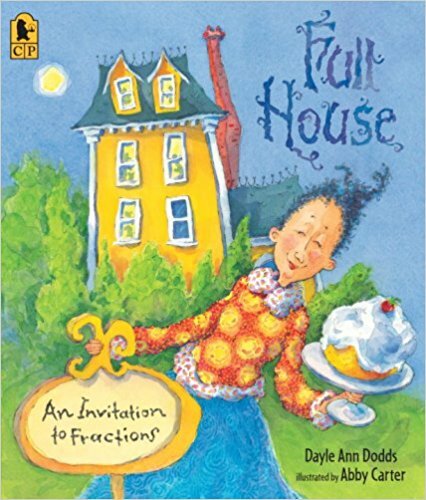 A great book for a quick introduction to fractions! 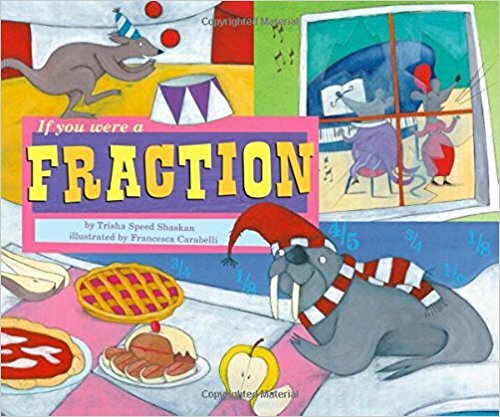 If You Were a Fraction is a book full of rhymes that also introduces the basics of fractions. The author does a great job focusing on the definition of fractions and provides fun examples of many different types of fractions! Learning is much more fun with food, am I right? Food is a great tool to use when introducing this new skill. Graham crackers – This is a great way to introduce more standard fractions. One whole, one half, and one-fourth. Kit-Kat bars – Again, another great way to introduce those standard fractions. Hershey bars – For more advanced fractions, this is a perfect snack to use! 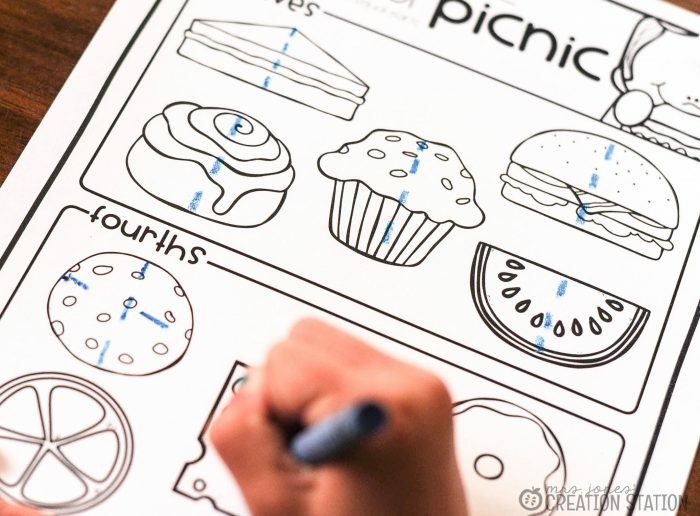 Apples – for a slightly healthier approach to fractions with food! There is no better way to practice a new skill than center time. But first, the best way to get the most out of centers is to practice together in small group instruction. At this time, you can monitor your learners to make sure they are on the right track. Once you feel they are confident in trying a new skill by themselves, you place it in a learning center. 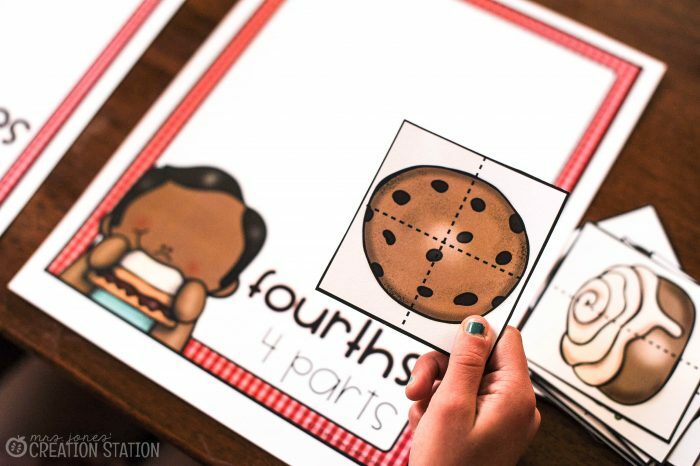 In this case, these fun fraction cards are perfect for center time. You can make it independent work or create a game out of it with partners. 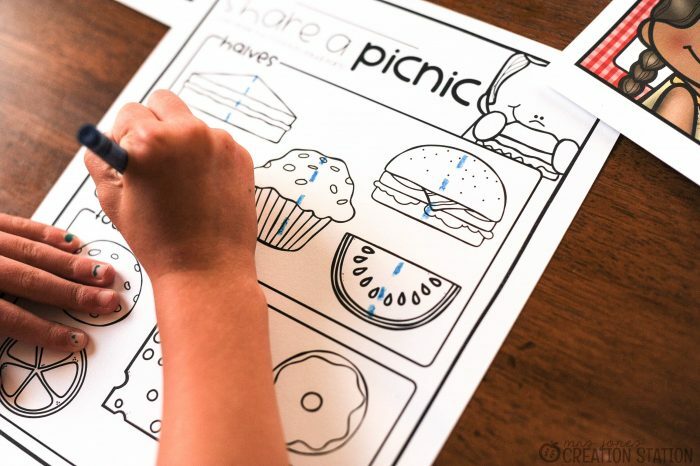 Just simply print the cards, laminate, cut and store in a ziplock bag or pencil box. Once your students are ready, they place the sorting mats on their desk, and sort each card into halves or fourths. Need a quick assessment at the end? I’ve got your covered! Included in the free fraction game is a printable that you can use in small groups for reteaching or a quick assessment to see if they grasped the new concept. 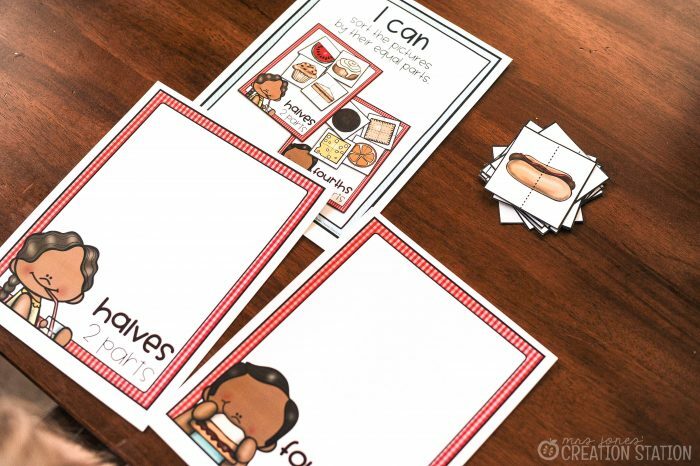 You can grab these free cards and printable for your small group instruction or center time by clicking on the download link below! Check out other Math packs that I have to offer! Need a one stop shop for your math lessons? My Math Activities for Little Learners has everything you need to run full math units! From whole group activities to math centers, this mega pack has everything you need! Numbers to 20 is a perfect addition to your homework stash. It’s a great resource to use when practicing number recognition and counting! Would your life be less stressful if you knew all of your math centers were done before the school year even started? Well, I can help you out! My Monthly Literacy and Math Center mega-bundle does just that! The download button is not working! Hello! The problem should be fixed now. Thank you for letting me know! I seem to have difficulty downloading this resource. It seems like the link is not working. Hi Heather! It should be fixed now! Hi Lisa- Let me see if I can help. Did you click on the Download button at the bottom of the post? Can you explain what happens when you try to download?